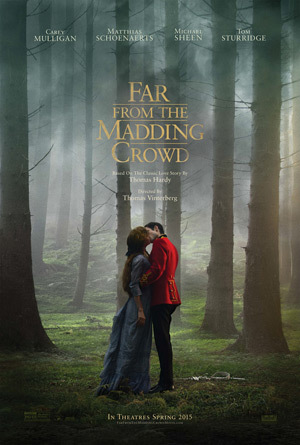 Carey Mulligan, Matthias Schoenaerts, Michael Sheen and Tom Sturridge star in the romantic drama Far From the Madding Crowd, based on Thomas Hardy’s classic novel of the same name. In Victorian England, a headstrong woman (Mulligan) attracts three different suitors: a sheep farmer (Schoenaerts); a reckless Sergeant (Sturridge); and a prosperous bachelor (Sheen). Running Time: 1 hr. 59 min. MPAA Rating: PG-13 for some sexuality and violence. The story of independent, beautiful and headstrong Bathsheba Everdene (Carey Mulligan), who attracts three very different suitors: Gabriel Oak (Matthias Schoenaerts), a sheep farmer, captivated by her fetching willfulness; Frank Troy (Tom Sturridge), a handsome and reckless Sergeant; and William Boldwood (Michael Sheen), a prosperous and mature bachelor. This timeless story of Bathsheba’s choices and passions explores the nature of relationships and love – as well as the human ability to overcome hardships through resilience and perseverance.